Have you wonder if you planned something out, whether you are doing things the right way? 12 years ago, I had the idea how I could plan my insurance protection by doing it myself. 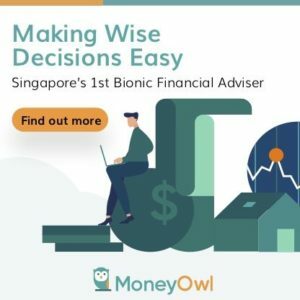 There were not much resources then in Singapore and the traditional way was to listen and buy what your insurance adviser recommended. These days, readers like yourself are more aware on the different forms of insurance. There are insurance resources out there. This makes DIY Planning easier. Over the years, I met with more planners, seen more cases studies, did more numbers and I realize I was wrong about some things and right about others. Insurance is an important aspect of our lives and more people spend less time to think about it then they should. Not planning it well causes possibly future heartaches and also on going heartaches. The takeaway for you is to invoke thoughts which leads to actions if you realize you don’t have a philosophy, don’t have a plan, have no idea about your plan. Throughout the past 14 years when I was first introduce to insurance, my idea about insurance is influence by various sources. In 2002 to 2003, the web worked very differently from now. Searching is not so straight forward and insurance for Singaporeans is still a very niche subject. Without knowledge and guidance, I have no idea how to search. It is a very different world from today, where you could just put in “What insurance should I get?” and you have a list of resources to get you started. I am thankful that my earliest influences was from the sources that got me started in wealth building. It was a forum born out of Fundsupermart. While we discussed unit trusts, asset allocation and general investing, we also have the flexibility to discuss on insurance. We have some experienced financial advisers that were commission based dispensing and debating on insurance stuff. As people new to this, it is invaluable to be able to interact with them, and for them to be unselfish with the knowledge they have. I have about 4 insurance advisers along the way. Sadly, I did not learn much from them. The first adviser came to our army unit to talk about insurance. He is more of a relationship builder, and at various time, never failed to highlight how many hours of product training he undergoes, and how his company is much better and secured than other insurance company (I still remember that insurer’s parents being one of those embroiled badly in the Great Financial Crisis). I got a personal accident and a 43 year level term insurance from him. I decided to work with an independent financial adviser (IFA) introduced by my ex-colleague. This was when I thought I was “rather savvy” about things. I wanted to believe working with a commissioned based IFA was the way to go. However, she turned out to be another relationship focused adviser. Her company practice the model where the IFA focus on the relationship, while the insurance product manager recommends the best product out of the rest. In a way it is a good thing, I was rather versed in the simple insurance concepts. My next 2 agents came about, because the IFA left, then the one taking over left and then the final one is the one that I am left with. It was the first time I realize adviser turned over was a real thing. I realize that you cannot fully understand insurance, without understand the wealth building maths as well, since a lot of the products sold masquerade as wealth building products. Eventually, the picture of insurance I formed can be condensed to a Free Ebook provided by DIY Insurance. I took the long path, but I think for you guys and gals, you have an easy time. How you should use this article is read it to get a feel of how I look at things. I am not an insurance adviser, or certified to dispense advise tailored to you. Your situation could be very different from me. And as you will read, much of it is not just about what insurance products to recommend. I do encourage critical thinking in how you approach life, and thus read this and challenge my views, leave a comment if you think I am horribly misinformed, or that you do agree but have a different perspective. The total yearly premium is $3,660/yr or $305/mth. This is less than 8% of my take home disposable income. Here is what I thought or did right and not very correct. My experiences have lead me to come up with the following rule of thumb when looking at insurance. Based on my influences, these rule of thumb do change when I realize I have made mistakes, or someone pointed out some scenarios that I failed to take into consideration previously. It used to be in the past that when we talk about buying insurance, what we have in mind is an insurance plan that pays out for any kind of risks we faced. And it has to have cash values. We got more educated and more people now realize there is no single insurance that covers all the risks we faced. The able above is taken from the DIY Insurance E-Book. The insurance protection products are to address a particular needs. So there is no one size fits all. Thus, when we need to address many needs, we need not just one protection product. At the end of the day, you need to pull yourself back, and ask the question: Have you covered the areas that impacts you the most? When we are buying insurance, we are attempting to hedge the health and wellness risks we face in our lives, at various stages. It is similar to what many risks managers do at work. In project management, we come up with a risk register. The table above shows a personal risk register that we can come up with for ourselves. There is the risks we faced in life, the probability of the event happening, its impact to our lives and what can we do about it. This is why we engage a financial planner to define the risks for us. I think we could at least define these risks ourselves. You would at times face these fear, the difficulty is to articulate them out. The reward of coming up with this Personal Risk Register is that it makes you realise risks are real, and whether you have a solution or mitigating action for it already. If you have not, perhaps it is time to find how to alleviate these concerns or talk to a subject matter expert. We will all start off looking for a rule of thumb, such as what is the probability of a health event stopping us from working in our employed field and its impact. That is all well and good. What I realize is that over time, the probability and impact of events differ because we each lived very different lives. We need help at the start to be aware of what the triggering conditions for the health or life risk are, and according to the subject matter experts the risks and the impact. However, you do have to open up a conversation to discuss whether this is applicable for you, and at various stage of your life. One example is that my risk for item number 1 on the risk register above, death of the income earner and the family missing his income. I could put it as low risk, but that is because of my circumstances as a single and the age of my parents. The monetary impact will be different as well. If you have a family or build up less wealth, the impact could be far larger. We have been doing risk mitigation without insurance for a long time. It Is perhaps we are not aware we are doing it. From our risk register above, some of the mitigating actions involve money, but not an insurance company paying for you but your family saving up yourself. There are also risks that, the only mitigating actions is non-insurance based, such as building up an emergency fund, or building up wealth in the event you need something to supplement your income. You cannot buy insurance to mitigate the risk that your child becomes a contingent liability. Some of my friends are very proud that their insurance pays every single cent of their recent hospital trip. Insurance is such that if the probability of claim is high, its impact is high, the premiums that you pay will tend to be high as well. If you really do not wish for out of pocket costs, then you pay for more riders that are appended to your plans. My feeling is that, when you are unsure about what you are protecting against, you tend to pay more insurance premiums. Optimizing your insurance expense involves knowing what you want. 6. What is a Responsible Decision you should make? We all have limited resources, and hence we try to balance our financial and spending goals with insurance protection. Continuing our previous point on how much insurance protection to acquire, the question you should ask is: What would be the responsible thing to do? Taking ownership and being responsible means in this cash understand the scenarios that could happen and the impact to your life. It is also about what other goals you have and how can you come up with a plan to move forward on multiple fronts. Sometimes the responsible thing is also to admit you have too many other goals (not related to protection) and that you need to scale down. This could free up the cash flow to protect your family adequately. When I was young, and rather into this subject, I would try to find what is the most fool proof plan. I frame insurance as a topic to be optimise and important part of my world. As I grew older, I realize that doing that is good, but the focus is very wrong. We should hope that we would not need to claim insurance. If we need to then something is not right. Insurance focus the problem and solution on the money, when the problem and solution could be intangible in nature. If I were to claim $500,000 in late stage critical illness but I survive with quality of life severely affected, my insurance strategy works, but what do I gained out of this? The focus on the money side blinds us to the fact that we should do our part in taking care of our health and wellness. Proper body, mental maintenance, not subjecting the body to excessive physical, mental stress, not pushing the body to decadence can go a long way to minimize these risk events from happening. We cannot always win with these health and wellness prevention due to genetics, but at least we acknowledge that we do have a role to play in these risk mitigation. When you build in more flexibility into products (investment linked policies, universal life, 3 generation plans), there tends to be additional costs layered onto them. If minimizing costs is what you seek to do (which most are) yet achieve the same protection goals, then it is important to understand what you purchase, and go for the more straight forward generic products. What will impact our lives the most are the events that happen the most frequently and those that will result in us needing a large sum of money. I am not saying the rest are not important. For some the rest could be more important. However, for most people I find it hard to argue against these. And the out of pocket insurance outlay here is only for #2. Here, we are talking about term life insurance, whole life insurance, limited whole life insurance and the new hybrid of life insurance. We even have a debate of term life versus whole life for the longest time, primarily because of the difference in premiums and the approach we should take. Perhaps we spend too much time on this then we should. We failed to realize the impact of this risk is not felt by us, but by those around us. Once the event is triggered, we are no longer here. The idea here is that it is not unimportant but is less important then what society makes out to be. The saving grace is that it is not overly expensive before age 65. A level term of $500,000 coverage can be purchase for $800/yr in annual premiums. Having said that, the life insurance is one of the greatest gift, yet it is the least glamorous. It doesn’t evoke positive emotions from your loved ones, because most do not know the repercussions when it is missing in your life! However, for those who understands it, you should cherish it when your spouse bothers to plan for the time if they are not around, so that you do not have to suffer alone and go through the 3 alternatives I listed above. It is the gift for the pragmatic people. This has been argue a lot between people. To me term insurance is treating insurance as an expense and that you only need it till 65 years old. After 65 years old, the assumption is that you do not have any more dependence on your income, and therefore you do not need the death insurance. Whole Life is made up of a cash value and term insurance. If you buy term life insurance, the difference in premiums you pay for a whole life versus term, you need to invest, build wealth with it. If we look at insuring the assured to age 100 or 120 years old, whole life insurance and buy term and invest the rest is the same. For term insurance the premium will be much higher after 65 years old, and after 65, a lot of the payout from insurance will be paid out from you investing the rest of the money. Compare this to a whole life paying out from the insurance policy. There is little difference. When you buy a whole life insurance, you transfer the saving and investing risk to the insurance company. When you choose to buy term life insurance and invest the rest, you are taking on the saving and investing risk. In my mathematical modelling, the payout of a whole life insurance policy at 100 and 120 years old is roughly similar to that of buy term and invest the rest. There is only one period of difference, and that is just after 65 years old, where whole life insurance have a good payout and that the invest portion of the buy term and invest the rest plan have not “matured” enough. As I grow older, and seen more claims cases, I seem to have the idea that for many of the triggering health events, the health insurance seem to have bear a large part of the brunt. Here we are being sold that we need life insurance, critical illness, early critical illness and personal accidents. However, the common link amongst them is that, whichever of these plans, they are less of an importance to health insurance as a lot of the claims will be taken off by health insurance. Those plans become very supplementary and no doubt having them will better alleviate the problem. This means that if you are limited in your budget, taking care of your health insurance is important and an important cost to bear, BEFORE we talked about the other plans. It would mean that for the extremely poor, the consequence of the rest of those insurance is less. Knowing this may help them from overstretching their budget on insurance. A health insurance rider might cost $120 per year and it covers your deductible or co-insurance. To self-insure, you have to possibly save up $3000-$4000 to pay the deductible and co-insurance yourself. That $3000 can pay for 25 years of the rider’s premium, which will remove the deductible or co-insurance. This is hard to beat. From my experience tabulating insurance endowment returns, what the insurance company projected at the start to get you to buy the policies tend to be over optimistic. The rate of return used by whole life plans, endowment savings plan have been revised downwards over the years. 16. Don’t Mixed Wealth Building and Insurance Protection! One common area I have to help friends and family members untangle is when they purchase complex products. Advisers like to sell you complex products and somehow, they tend to fetch the best commission for them. The problem for you is, your adviser is not going to tell you which policies are for insurance protection and which is for wealth building. There are many friends who assume that the whole life policy with cash value is for wealth building. So the question is: At 65 years old are you going to cancel that policy to get the cash value? They often have no idea. As much of these decisions are delegated to the adviser or an imaginary friend of theirs (that only happen in their mind in moments), they couldn’t figure this out. So when I ask the question: How strong is your wealth machines at this point, they tend to omit all insurance like policies and say they don’t have much. It can be rather frustrating to people trying to help them. Since these complex products do cost more and is a planning nightmare, it might make sense to get generic insurance protection and generic investment financial assets. Make them easy to be separated. If not, tag which insurance policy is for protection and which is for wealth building. I have a recent reader who was able to do this on his own. Very impressed by him to be able to do that. 17. Is Insurance Premium a Survival Expense or a Rich Life Expense? Figuring out the nature of your expense is one of the important steps to figuring out how to build financial security into your life. It enables you to build wealth machine(s) that can pay out a wealth cash flow to supplement your income, or pay for your survival expenses when you lose your job, or transit to another job. It is very subjective whether your insurance premium is a survival or merely meant for a rich life. My take is that some are and some are not. I find some insurance as vital, such as the health insurance, disability income listed above. The expense in this area is vital for survival. The rest are rich life. I heard of many stories through my working life of how unemployment made my friend or relative’s father stop paying for their insurance and it comes back to haunt them. For the reasons, I stated above, things are not so catastrophic. The mitigating plan is to ask yourself the question: How much of life insurance, critical illness and personal accident do I absolutely have to keep? The answer may be 30%, 50% or 75%. You would essentially have a survival insurance and rich life insurance. You have to find that middle ground. You might also want to set a rule that the insurance decision be one of the last to be triggered. When you invest in overseas market, there is a risk that if the investor passes away, and the country have some form of death tax, a large part of wealth you build up may not go to your loved ones. Popular markets such as USA and UK both have it. Investors like this region for their exciting and vibrant markets but also they have better and more liquid exchange traded funds. USA have estate duty of 50% tax above US$60,000. UK have an inheritance tax of 40% above 325,000 pounds if you do not leave it for your spouse. The mitigating solution can be purchasing term life insurance to provide the dependents of this 40-50% of your current (or future) portfolio value. If your portfolio is US$500,000 and a tax will shave off SG$350,000, the cost of insurance could be SG$350/yr. This works out to 0.046% of your US$500k portfolio value. You are treating the cost of assuring against these overseas investment risk as an expense. This insurance would need to be evaluated together with your wealth building and less so on your overall protection strategy. 19. Premium Waivers are Good to Haves…. Some insurance policies such as insurance endowments, whole life plans, investment linked policies and retirement plans have an additional rider called premium waiver. The premiums look very small compared to the main policy premium, but the premium waiver can be rather useful. Should the assured suffer from a risk event for the policy and eligible for claim, the assured do not have to pay subsequent premiums. Premium waiver is like an insurance on the premium payment. Premium waiver riders can be useful if they are applied on the policies mentioned above. It assures you that in the event of the trigger, you do not have to worry that due to your health issues, these savings plans and retirement plans do not get funded. Not all premium waiver would work well because a few policy’s triggered event can only take place when the assured is not around, or have fully claimed all the cash value. Critical Illness (CI) remains one of the expensive component in insurance protection. It allows the assured to claim a lump sum if the assured suffers from one of the 30 defined critical illness. Since I started working, this definition have expanded to 37 types of critical illness. Different insurance companies might have additional coverage for specific aliments. The objective of the CI is to replace 3 to 5 year of your annual income as well as provide a lump sum for alternative treatment or other forms of care. I always have a suspect that, much of the magnitude of treatment cost will be borne by the health insurance, or the integrated shield plans. My experience with a loved one proves that this is correct. I also think that if we were to alleviate 3 to 5 years of cash flow, the disability income could be more appropriate. Still, critical illness plan is vital because nowadays, many people depend on supplements and alternative treatment which are less abrasive than standard treatment. These alternative treatments are not cheap. The contentious debate is whether we should rely on term insurance till 65 years old or have a limited whole life till possibly 100 to 120 years old. I lean closer to the idea that even after 65 years old, not having to pay out of cash should a CI event is trigger is very assuring. The counter argument to this is that, by then, the value of the limited whole life policy would not be able to alleviate much of the costs as health care costs would have outpaced what you have purchase. You can adopt the middle ground, as I have. I have a limited whole life insurance with CI cover for this. However, the assured amount is not the full $200,000 to $300,000 many require but $50,000. It doesn’t kill my cash flow but more of a good to have in that if I last more than 65 years old, I have a CI for life to resolved a small part of the costs. When I started planning, I made a mistake of lumping death, TPD and critical illness together. If I am thinking of increasing my coverage, I have to increase all three. It is only later in life, that I realize the purpose and coverage required for CI and death is very different. As such, I should not look at the three together but to have separate amount assured for death , TPD and CI. The cost is also significantly different between CI and traditional term life insurance. Separating them could optimize your cost better. Term life insurance before the age of 65 years old is already rather cost effective. However, some folks might want to optimize further. They could make use of a decreasing term life insurance. In level term life insurance (which is the usual flavor), the coverage or sum assured stays constant throughout the duration. For example, if it is 200,000, the coverage stays constant. For a decreasing term life insurance. the coverage gets lesser and lesser as the tenure nears its end. Decreasing term life insurance fits the kind of assurance where the impact of your risks becomes smaller and smaller. What are the examples of things like that? The most common is your home. As you pay off your mortgage, the liabilities on the home you need to pay off becomes less and less. HDB would want you to subscribe to a mortgage insurance called Home Protection Scheme, so likely you would have bought a decreasing term life insurance. 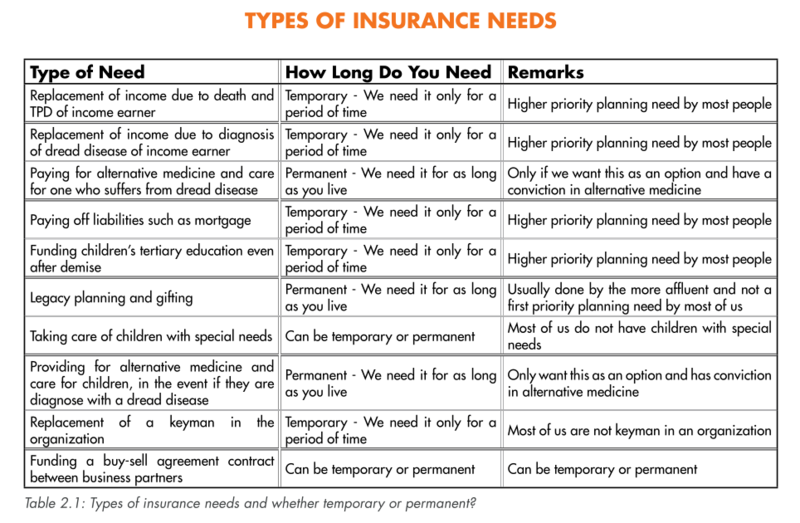 The table above shows some available decreasing term insurance. Note that not all of them can be purchase without a mortgage. In contrast, if you purchase a 25 year level term, the premiums you get is something like above. However, disability income is seldom sold because advisers do not earned as high of a commission. Disability Income assures the person that, if the doctor assess he cannot perform at his profession earning the same level of pay, and have to step down to no pay or work in something that his pay is lower, the policy pays out the difference. The tenure would last to as long as 65 years old. For Most of us, our human capital or our ability to work is our greatest asset, yet it is something we do not assure against. The premiums are very manageable for a salaried worker. Advisers, need to put food on the table. And due to that, they need a good system so that they can recommend the right products, provide good advice and be remunerated accordingly. Unfortunately, the age old and prevalent commissioned based structure most advisers were paid under is challenging to fulfilled that. They have a high incentive to push the products that gives the greatest commission. They undervalue the advisory and the planning portion of things. 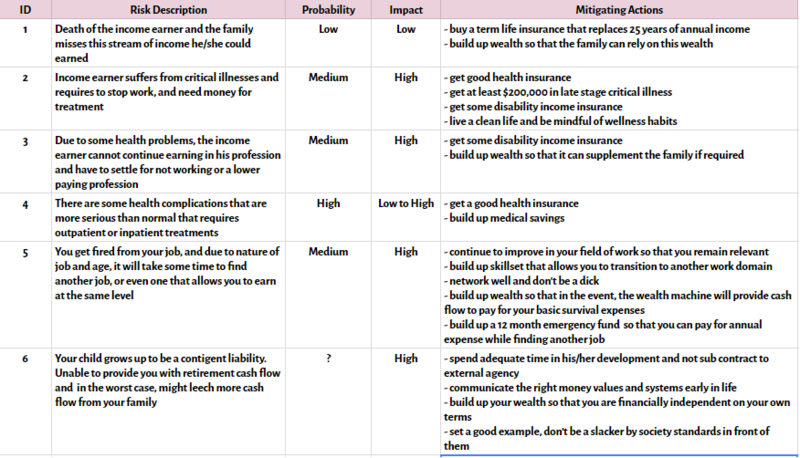 The table above is taken from DIY Insurance’s Ebook. It shows how much you need to be adequately cover, if the adviser determines you need $500,000 in death/TPD coverage. You have a choice to use term life insurance, whole life insurance, or a hybrid whole life (which is a whole life insurance + term life). 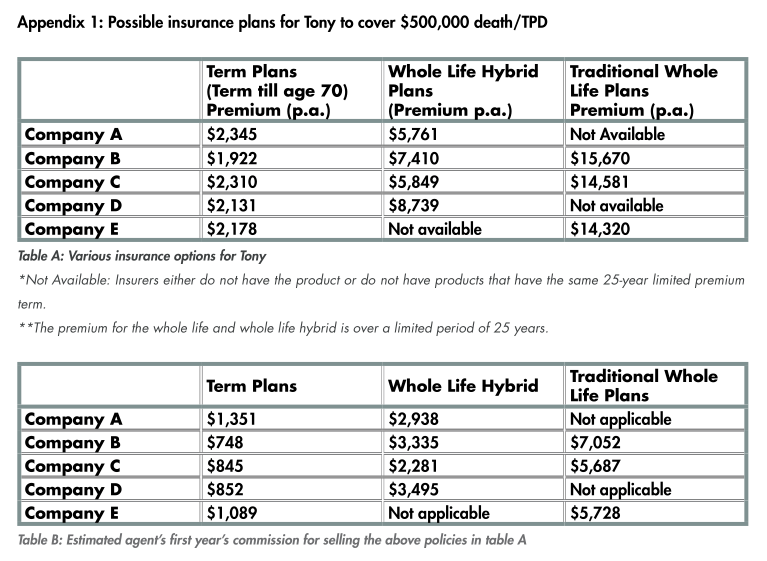 Notice how much more expensive is the premiums of the whole life and hybrid. Over the lifetime, the adviser gets to earn 80-100% of at least 1 year worth of premium. There is greater incentive to sell a plan whose premium value is higher than one that is lower. If the client has a limited budget, the adviser would likely recommend a whole life plan with LOWER coverage, over the term life insurance, due to the higher economic incentive of the whole life plan. This result in the client to be under-insured. This is a very common sight. When I meet with readers and friends who are well versed in insurance, their number one headache is to ask me to recommend them a reliable adviser. Wilfred being fee based doesn’t get paid through commission but by giving you advice and figuring out the nuances of your current situation. There is a fee to it. If you are interested to work with a reliable planner, you can sign up through here for buying the right life and health insurance, and generating passive income in retirement planning. These are my affiliated links, and you get 50% OFF the consultation fees. This is a way to support Investment Moats as well. Not many people would proactively plan for the own insurance protection, unless they actively seek to become a responsible adult. Or they were ‘triggered’ and seek to find the truth. For most people, their decision to get insurance protection was due to experiences from loved ones. Other than this, insurance protection is not a topic for the lunch time. Therefore, good things need to be sold. Whether is you selling to your best friend, or your siblings, or advisers trying to sell to you. Not selling sometimes, is not doing the prospective person a huge disservice because he or she might suffer from an event that had they bought some insurance protection, things would turned out better. I am sure along the way, life as well as other thought leaders will change my perception on things. I believe good advice comes from competent technical knowledge in the insurance protection field, but also experience to understand the real world and balancing things within the client’s constraints. And you need to be persuasive to push good things to clients. My thoughts of this over the past decade is that, if you put in effort you can figure out the nuances of insurance so that you become a more informed client. This prevents you to a certain extent to purchase the wrong products, or be under-insured. However, there is a place for good advisers as people still feel better with some hand holding. Ok! this is interesting. I have came across many articles during this 2 weeks about California and some states in US slashing public sector’s wages. While i am neutral on why the need to do that, this article gives me a glimpse of why they are all running budget deficits. Let’s take a look at some public sector salaries in Illinois, primarily Chicago and Cook County, but in comparison to the Governor’s office. The Chicago Sun-Times is reporting Top cop’s pay tops the charts. They may be the bosses, but Mayor Daley, Gov. Blagojevich and Cook County Board President Todd Stroger are not the top wage earners in their respective governments, according to a Chicago Sun-Times survey of public payrolls. It turns out that a registered nurse working the night shift at a state Department of Human Services facility for the developmentally disabled made $201,000 last year — $35,000 more than the governor. And Chicago Police Supt. Jody Weis makes nearly $90,000 a year more than his boss, the mayor, while Stroger’s [Cook County Board President’s] special assistant Laura Lechowicz-Felicione pulls in $2,700 more than her boss. Stephanie Marshall, the retiring president of the Illinois Mathematics and Science Academy, also out-earned the governor by more than $95,000. The nurse, Loreatha Coleman, who works at the state-run Howe Developmental Center in Tinley Park, earns a base salary of about $64,000. But a 10 percent night differential and lots of overtime more than tripled her pay, a DHS spokeswoman said. That is a partial list. The article has more. Is it any wonder states and cities are strapped for cash?